Often visitors to my site E-mail me and ask about some uniquely “Japanese” thing that they’ve seen here. They ask me to explain what it is. I’m happy to answer any questions about Japan as best I can. Feel free to contact me with any questions you may have. I often get e-mailed questions about things, places, events, schedules, etc., etc. about Japan. I reply to all of these e-mails as promptly as I can. But I started thinking that maybe I should put the answers to some of these questions on my blog. So, I made this page to try to explain what some of the sights in Tokyo that I have been asked about by my blog’s visitors. Q: What are those bags that are taped closed at the front of many stores in Japan? Q: What are those yellow blocks with bumps that are on the sidewalks in Japan? 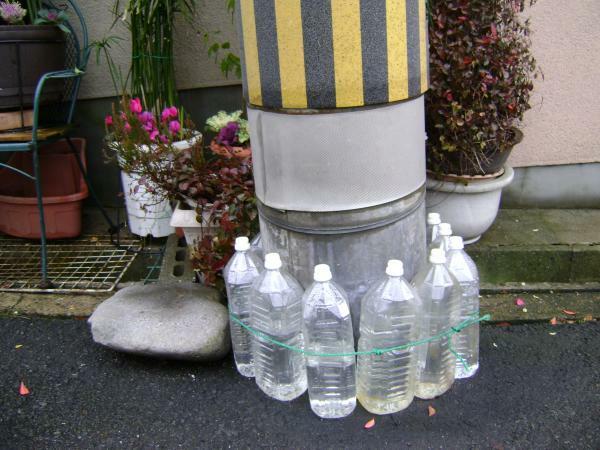 Q: What are those plastic bottles that I’ve seen around the streets in Japan? Q: What are noisy places around Japan that are full of people sitting in front of machines? 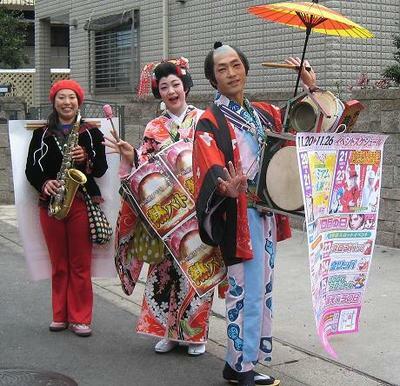 Q: What are those small groups of people dressed like samurai and geisha who walk around the streets of Japan playing unusual music? Yes, there are some character buses, planes, etc sometimes. Oh, thank you. Maybe one of these days I’ll add more to this page. Do you have a question for it? Very cool section. I’ve also wondered about the water bottles! Thanks. Unfortunately, things like those and the chindonya are becoming less common in Japan these days. I was excited when I saw a Chindonya troupe last year with two team members and this year again but with three members. They often parade in shoutengai (shopping street). I managed to take their pictures at both times. They used to be seen often when I first came to Japan. I added a question at the top about the yellow blocks on Japan’s sidewalks. I just updated this page again. The new question is about “Lucky Bags”. Thanks for enlightening more about Japan. I would love to see and take a picture of chindonya. You’re very fortunate to come across one. Did they pose for you? >Thanks for enlightening more about Japan. I’m happy to hear that you could learn from my posts. > I would love to see and take a picture of chindonya. Are you in Japan? They can still be seen…just not as often as when I first came to Japan. >You’re very fortunate to come across one. Actually I have seen Chindonya a number of times. >Did they pose for you? No, but they don’t walk too fast. Get idea for a page (love the picture along with the question) … hope you grow this like your Festivals in Tokyo page. >hope you grow this like your Festivals in Tokyo page.